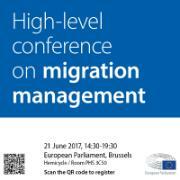 Managing migration and ensuring a stable and prosperous environment at the borders of the EU will top the agenda at a high-level conference on 21 June from 14:30 to 19:30 in Brussels. The European Parliament will host the conference on migration management ahead of the EU summit to launch a platform for regular dialogue between all actors involved. It will address responsibility sharing among Member States, ensuring a stable and secure environment both in and at the external borders of the EU, and tackling the root causes of migration through cooperation with third countries.